Behold, how good and pleasant it is when brothers (sisters) dwell in unity! To the question, “What does community mean to you?” my answer, without hesitation, is Girls Night! It’s not an event; it’s a state of mind… I wrote this awhile ago, but it is still a rich representation of my crew, mi familia, my posse, by peoples, my community. It’s not just my girls, but that’s where it begins. This is a story about my community. Thanksgiving Friday. Our house full of people over on Thanksgiving Friday--to share our leftovers along with whatever anybody else brings. With no pressure to do anything besides sit around, we can eat, chat, and have a good time. Over the years, the cast has broadened from couples to families, and now groups retreat to separate spaces; men gravitating round the flat screen to watch yet another game, children at the Wii or playing randomly around the house, and women, round the table in the dining room, nibbling and musing about life. We are having Girl’s Night. At the movies, in the dark, tense, terrified, not knowing when but certainly what he is going to do. Beau Willie’s holding those babies, and we are about to experience the pain. Watching the screen adaptation of Ntozake Shange’s choreopoem, For Colored Girls, once again, it’s Girl’s Night. Sunday night, following a performance of our liturgical ensemble, at a dinner where we danced but were not fed, we grabbed takeout and invaded a girlfriend’s house. She hadn’t been with us earlier in the evening, but we needed her for fellowship, to debrief and unwind, so, once again, Girl’s Night. We don’t do them regularly, but they’re always right on time. I am thankful for my girlfriends. For so much of my life I avoided girl packs, not trusting that I could be myself and find genuine camaraderie. 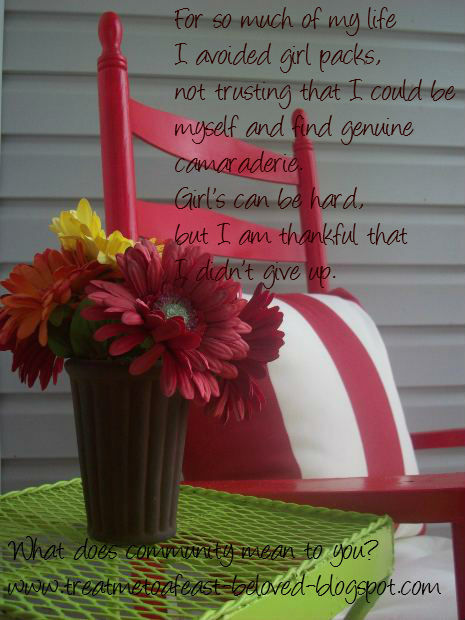 Girl’s can be hard, but I am thankful that I didn’t give up. I know I had to grow into the person I am to appreciate the kinship and amity found in a circle of women. This weekend afforded me more than good measure of opportunity to hang with my girls, including spending the holiday weekend hosting my best friend and her family. We seldom make time to hang out and just be, so given the opportunity to be where they are, I am deeply grateful for the marvelous women I call my friends. Among my friends are educators, authors, executives, therapists, writers, producers, dancers, poets, mothers, grandmothers, sisters, phenomenal women. We laugh, share stories about work, husbands, boyfriends, ours and each other’s children, people we’ve met, people we know, dreams we intend to make reality. We lean on one another. We laugh at each other. We pray together. We pray for each other. We minister each other through heartaches, illness, death, miscarriages, pregnancies, job loss, new love, divorce, and the never ending succession of crazy people who enter our lives. We give and receive advice we will expect to need and hear later. We talk each other onto AND off of ledges all the time. We are awesome reflections of God’s bounty and redeeming grace. It is good and pleasant, our many and varied friendships. We desire each other’s company. We do network and “hook each other up” pretty often, but we don’t need to be together, not in any transactional sense. We choose each other. We care about each other. We are sisters. I’m borrowing from an old gospel song as I settle down to rest and recover from my weekend…“What a fellowship, what a joy divine” leaning on and hanging out with my girlfriends. My wise women are a blessing, and for each of them, what they bring, what they give to the world, what I learn by watching them and simply being in their presence, I am thankful. Just further evidence that God is good.